On these pages you will find information about Google Apps for Education workshops and sessions I have facilitated or have scheduled to facilitate soon. In addition I provide links to resources and my resume of training and speaking. 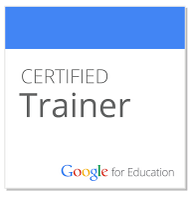 On December 18, 2014 Google informed me that I was successful in my application and I am now a Google Certified Educator and a Google Certified Trainer.